The Altador Cup is always a sight to behold in Altador when it rolls around every year. And each year, fans come out from all across Neopia to watch history unfold. But while some teams get tons of attention and fame, such as previous cup winners Haunted Woods and Krawk Island, there is one team that doesn't quite get the attention that they deserve. That team is the one that started this whole tournament, Team Altador. Me: Thanks a lot for taking some time from the games to chat Winberto. I'm very grateful. Hope you don't mind being interviewed as you're preparing for the tournament. Winberto: Heh. No problem. I don't mind. Phew! I needed a breather anyway. Me: Okay then. If you don't mind, I have a few questions I wanted to ask you. Winberto: Fine with me. Shoot. Me: All right. Well, first question. How does it feel to be a millennium old Wocky from Altador in an exciting and new world such as the new age Neopia? Is it any different from the Neopia you came from? Winberto: You mean after the whole "Darkest Faerie" crisis? It's okay with me. In fact, this new Neopia's a lot more exciting than back then. There's tons of new things to see, people to meet and food to taste. Heh. I remember me and the others on the team went on a big cross country trip across Neopia after our first Altador Cup after the millennium trapped outside time. The folks on Neopia now are actually pretty cool and great to know. Me: That's great. I was wondering if you would feel out of place being in Neopia again after a millennium passes by. Winberto: Ha! That only makes this new one a lot more fun! Me: Okay. My next question is how did you come to join Team Altador? You've been on the team since year one. And everyone who plays for Team Altador absolutely love you. Winberto: Ah ha ha. Now THAT takes me back. Okay. So it's like this. 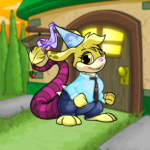 I was a young rebellious Wocky in Altador, right? Living with my parents and taking care of my Fire Yooyu, Blaze. Everyone in town always talked about what kind of "crazy situation" I'd get myself into. Well, it was early one afternoon and I was taking a slushie break after doing a few sprints around town. I do my best to keep myself in good physical shape. Me: Yeah. No kidding. You're the fastest on Team Altador, after all. Winberto: Right. Anyway, I headed over to my favorite slushie shop and I was waiting in line to order. But just as I get in front, some short little "runt" butts in front of me to order. And, of course, after I was waiting in line for so long, I was peeved and got into a bit of a tussle with him. Little did I realize that was Captain Remis. Me: Yeowch! Did you guys make out okay after? Winberto: Ehhh... yes, I suppose so. Timu came and broke the two of us up. But afterwards, when I realized who Remis was, I quickly apologized for acting out. He took it okay and mentioned that he admired my quickness when we were duking it out. He figured I could handle a Yooyu pretty good and he gave me a shot at the team. I took the test and passed, officially becoming the newest Altadorian to join the team. Next to our new guy Foltaggio and six year running Lyvon, I'm the THIRD youngest on the team. Me: Ah yes... about Timu. That actually brings me to my next question. What was your reaction when news spread about Altador and Shenkuu trading players? Timu for Foltaggio for last year's cup? Winberto: Oh. That? It... It was a lot to take in, especially so close to the cup. Timu's been on Altador for so many years, even BEFORE we got into that mess so long ago. I felt she was a real staple on the team, we all did. In fact, it totally shocked the rest of us when Remis said they talked about trading her for that eye patch wearing guy from Shenkuu. But, she assured us that she would do just fine on a new team. I... kind of took it the hardest, though. Me: Ooh. Sorry for bringing up such a painful topic. Winberto: It's okay. You didn't know. But... Timu and I keep in touch. We see each other around Altador still. Heh. 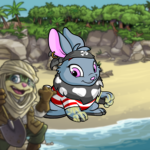 At first, I totally didn't recognize her in her new Shenkuu outfit. We share slushies, stories and memories of the past. She still lives in Altador after all. So it's not all bad. Me: Okay then. So... what was it like with former Shenkuu Right Forward Foltaggio on the team? Winberto: You mean Folggy? Ha! That guy's a real hoot throughout Altador. When he first came to Altador to join, we threw him this big welcome party that spanned the whole colosseum. Practically ALL of Altador came out to greet him. After all, Altador itself is a really big family. Me: Heh heh. He must really like being on the team. Otherwise, you'd think all of you greeting him at once would've scared him back to Shenkuu. Winberto: Ha! Yeah. You'd think. But he's getting used to playing for our team now. We had our differences and what not in the past, especially about our different cultures and lives, but he's a good team player. Plus, I dig how he swapped out his Shenkuu patch for our team's logo on his eye patch. Never did tell me why he's got that thing on his face yet. Weird. Me: Anyway, getting back to the actual Altador Cup, how are you taking the years of placing below tenth? Are you guys taking it all right? Winberto: Huh? Yeah. We're taking it fine. We're not some crazy team that's obsessed with winning. We play to the best of our abilities and for all the Altadorians watching in the stand. To us, the Altador Cup isn't all about winning that big shiny trophy. It's about showing the people of Neopia how much we've grown since the last cup. Me: Spoken like a true Altadorian. So do you have any rivals from any of the other teams? Winberto: I sure do. Let's see. I had a HUGE rivalry with Soley during the years he was in the cup. I used to see Folggy as a rival too, but I see him more as an equal now that we're on the same team. Oh. I also like playing against Terror Mountain. Their team captain has quite a few tricks up her sleeve. I also see some rivals on Haunted Woods and Tyrannia too. Can't exactly remember their names right now. Me: Okay then. For my final question, in your own words, what do YOU, Winberto Seliz, want for Altador's future? Winberto: Heh heh. What any other hot blooded Altadorian wants. To keep seeing the sun high over head and to keep both eyes looking to the future. After all, though the sun sets each day's end, it always rises the next. And that's how I see Team Altador. We've got nowhere to go but up, like the rising sun. And maybe, someday, Timu will come back to join us again. I think that's part of the reason why we didn't really give it our complete "A" game last year, having changed our roster and all. Me: I hope so too. Well, thanks for taking the time to chat Winberto. Hope you know that next time you're on the court and you hear the crowds cheering, I'll be there rooting you on along with every other Altador supporter. Winberto: Heh. Thanks. And, hey, if you see Timu around anywhere, tell her that I wanted to ask her for a get together at our old slushie hangout in the Bazaar District.